Catch-up TV to account for 40% of Christmas TV viewing | What Hi-Fi? Brits are predicted to watch around 86 million hours of TV on Christmas Day, giving an average of 3.45 hours per household. Research suggests that 15 million hours will be viewed through catch-up TV services – often in an effort to prevent family arguments over what to watch. Furthermore, around a third of participants stated that the TV would get switched on around 10am – the most popular time to fire-up the gogglebox – with many stating that the TV adds to the atmosphere on Christmas morning. 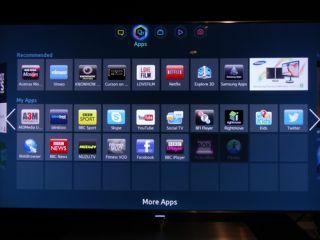 The research, commissioned by Samsung and involving a survey of 2000 people, also predicted that soaps would be the most popular TV genre to view through catch-up services. Unsurprising, as soaps are pretty popular on-demand at the best of times. Samsung is currently the only TV brand to offer the complete range of catch-up services through its smart TV platform, so no surpise there's a catch-up angle to these findings. The company has turned out some impressive TVs this year, from the Award-winning Samsung PS51F5500 to the curved OLED KE55S9C and the 4K Ultra-HD UE65F9000.